The range of high-frequency attenuators by Susumu we offer here at Rhopoint Components covers the operating frequency of up to 30GHz (ATS series, up to 10GHz for PAT series) and a range of attenuations and tolerances to satisfy most requirements within the wireless communications market. Utilising the thin film technology and wrap-around terminals, they are available in various surface-mount chip sizes - the PAT0510S is currently the smallest surface-mount attenuator on the market! Browse our range of high-frequency attenuators below. The ATS2012 series of thin film high frequency chip attenuators from Susumu offer designers a high frequency operation up to 30GHz in a miniature surface-mount 0805 chip size. These attenuators are available with various circuit and pin arrangements as well as offering an internal circuit which is specially designed for 0-10dB attenuation. The PAT0510S series of thin film precision chip attenuators from Susumu offer the designers low noise and good high-frequency characteristics. 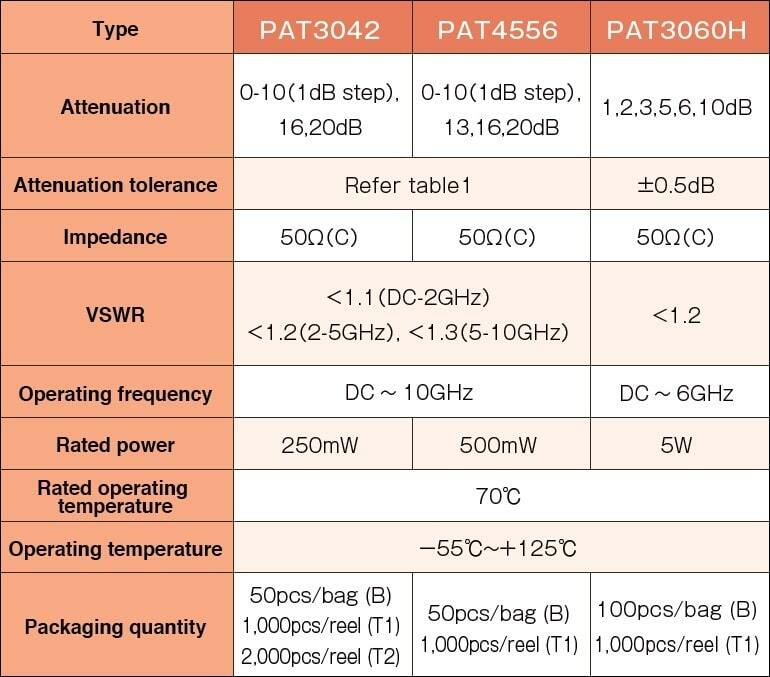 The PAT0510S series is available in 0402 chip sizes and the operating frequency range of DC ∼ 10GHz. They have a wrap around terminal similar to the regular chip resistors which makes it easier to mount and it contributes to miniaturization of devices. The PAT0816 series of thin film precision chip attenuators from Susumu offer the designers low noise and good high-frequency characteristics. 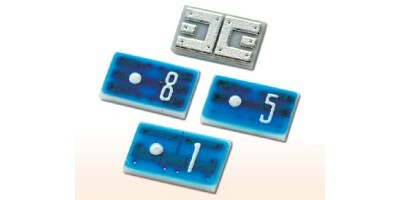 The PAT0816 series is available in a 0603 chip size and the operating frequency range of DC∼10GHz. They have a wraparound terminal similar to regular chip resistors which makes it easy to mount and contribute to miniaturization of devices. The PAT1220 series of thin film precision chip attenuators from Susumu offer the designers a low noise and good high-frequency characteristics. The Susumu PAT1220 series is available in a chip size of 0805 and with an operating frequency range of DC∼10GHz. The wrap around terminal makes it easier to mount and contributes to miniaturization of devices. The PAT1632 series of thin film precision chip attenuators from Susumu offer the designers low noise and good high-frequency characteristics. The Susumu PAT1632 series is available in a chip size of 1206 and with an operating frequency range of DC∼3GHz. The wrap around terminal makes it easier to mount and contributes to miniaturization of devices. The PAT3042 series of thin film precision chip attenuators with a wider frequency range from Susumu offer the designers low noise and good high-frequency characteristics which makes it possible to handle circuits with different frequencies with ease. The Susumu PAT3042 series is available in a chip size of 1612 and with an operating frequency range of DC∼10GHz. The distribution of the signal terminals in the middle and ground terminal at the ends, are designed for easy integration to coaxial connectors. The PAT3042S series are thin film precision chip attenuators from Ssumu offers the designers low noise and good high-frequency characteristics. The Susumu PAT3042S series is available in a chip size of 1612 and with an operating frequency range of DC∼3GHz. The wrap around terminal makes it easier to mount and contributes to miniaturisation of devices. The PAT3060H series are precision thin film chip attenuators from Susumu offers designers low noise and good high-frequency characteristics which makes it possible to handle circuits with different frequencies with ease. The Susumu PAT3060H series has a wider frequency range of DC∼6GHzand and is available in a chip size of 2412. The distribution of the signal terminals in the middle and the ground terminals at the ends are designed for easy integration to coaxial connectors. The PAT4556 series are thin film precision chip attenuators from Susumu offers designers low noise and good high-frequency characteristics which makes it possible to handle circuits with different frequencies with ease. The Susumu PAT4556 series has a wider frequency range of DC∼10GHz and and is available in a chip size of 2218. The distribution of the signal terminals in the middle and ground terminals at the ends, are designed for easy integration to coaxial connectors.